Join the world's top experts who reveal the complex inner workings of international law and how our world relies more and more on co-operation. International law is a system of laws that are agreed upon by most of the worlds civilized nations. It's what holds organizations such as the UN and NATO together. It also determines how international tribunes and court cases are handled. Seem simple? Hardly. International law is as complex and layered as it is interesting. In this program we are introduced to some of the world's leading experts on international law. Experts such as Prof. Tim McCormack, who presents the concept of state sovereignty and why it's such an important part of international law. Later, we learn from Prof. Gillian Triggs why recognizing individual states is so complicated and how international law has changed over the centuries. From criminal acts such as circumventing anti-proliferation contracts, to providing protection to those in need, International Law and Global Governance provides an in-depth look into the law that holds the civilized world together. An engaging and easy to understand documentary that provides clarification to an otherwise tangled topic. It is estimated that over 160 million people died during the wars of the 20th century, many of which included acts of torture and genocide. International law is often described as being the �general principles of law� that civilized nations throughout the world recognize, and modern international law aims to protect humans against these atrocities among others. 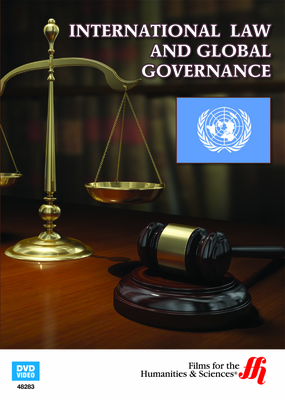 This program gives more specific details and insight about this broad definition of international law and discusses a range of topics that include: international and domestic law, the importance of international tribunals, courts and the UN, information about organizations such as the IMF, NATO and the Red Cross, and other topics relating to international law.